For a long, long time in my life I went all kinds of crazy with my hair, dying it from black to blonde to all shades of red and pink till I eventually arrived at ‘ginger’ as my perfect colour. I’ve been with this colour for over a year and a half, which for me is like an eternity, which says a lot! Up until recently, I was always using my trusted L’Oreal Feria Mango Intense Copper that I stayed loyal to even when L’Oreal decided to change the product (but claiming that it was the same, which was true rubbish!) but thanks to Leanne I’ve discovered an even more perfect ginger with L’Oreal Feria Paprika Power. It’s a super intense fiery red ginger, even on my normally dark now greying hair, which is just perfect. It’s so vibrant, but it still looks natural and I’ve been getting tons of compliments for it (who doesn’t mind that, right?). But do keep that in mind – if you’re a blonde, it will be even more vibrant (you can probably be spotted from out of space haha) so maybe don’t leave it on for the full time or go for the Mango Intense Copper first. Of course there are moments where I’m wishing I could have my magenta pink hair back, but in all honesty, this L’Oreal Feria Mango Intense Copper and even more so the Paprika Power dyes are just holy grail for me. Do make sure that once you dyed your hair to really take good care of it with moisturising hair care products, because any hair dye regardles of how long you leave it on will take some strength and health out of your hair! Depending on your budget, I recommend the John Frieda Full Repair Deep Conditioner (£6.29), the Joico K-Pak Mousiture Intense Hydrator Treatment (£16.20) or the Milk_Shake Conditioning Whipped Cream Leave-In Mousse (£12.55) or the Milk_Shake Active Yogurt Mask (£11.44)! 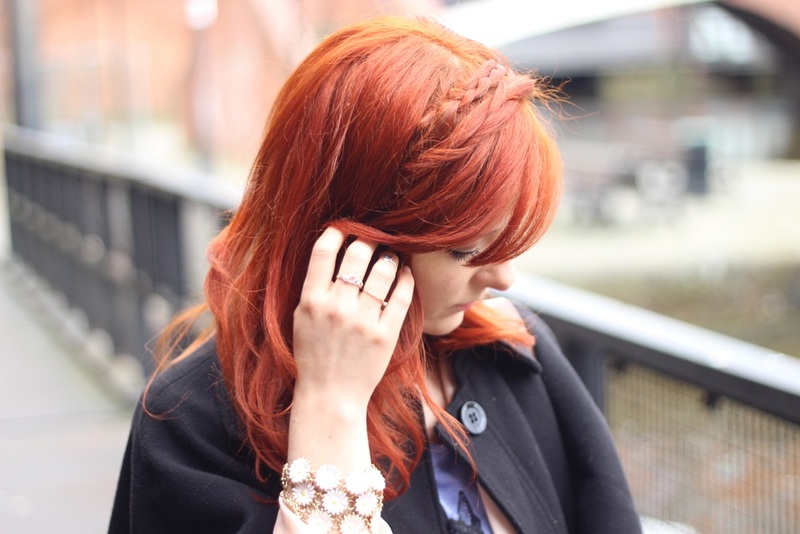 I’m definitely going to stick to this hair colour – I just love it! Do you dye your hair a lot? What is your go-to colour / brand? How do you look after your hair after dying? I’ve settled on purple as my colour (for now) although finding the perfect shade is my next big issue!! This is my hair dye too! I find fiery copper a good alternative to ‘non-natural’ colours, which aren’t allowed at my job. Looks absolutely stunning on you! Thank you so much Beckie! Im so glad that I’m not the only one who likes Gingers! I dont see the whole fuss about it! I absolutely LOVE this colour on you! It’s super sassy and vibrant – GO GIRL! Hey Missi! just saw this! So sorry to hear that you have issues with this colour. Assuming you following the instructions, best is to apply it on dirty hair, so maybe dye it like 3 days after washing your hair. and try lots of colour protective products like Tresemme’s or John Friedas. 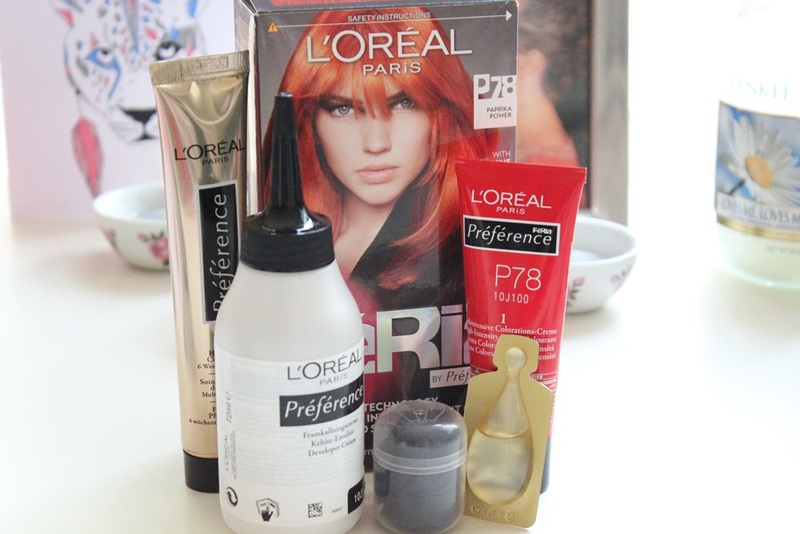 What was your hair colour prior to using this dye? Did you have to prelighten it or anything? I’m a natural redhead that has been experimenting with a few ginger hair dyes to brighten up my hair colour, and none seem to really do much for me, but the colour of your hair in that picture is just perfect! oh yes if you have thicker and/or longer hair you will need more than 1 box to kick you off. obvs ive had this and the mango intense copper colours for over a year and a half now so i dont need to use 2 boxes, i only use one for redoing my roots and boosting the rest of the hair a bit. yeah actually it does! :( but then i think for me its got to do with the fact that i bleached my hair blond 2 years ago with even lighter / ombre’d tips and that now makes up the tips to about midway up. but then i guess its just standard? :( how do you care for your hair? try avoiding ‘clarifying’ shampoos, they strip the colour. I’m naturally a very dark brown. Had some bleach highlights put through to go red. But, I really want an all over permanent ginger now. Fed up of having dark hair where every time I dye it only the highlights change. So, is this dye permanent and would I have to lighten all of my hair with bleach/lightener if so can you recommend any? Hi hun, if you have very dark hair, then I think you will have to lighten your hair somehow — I’m naturally dark haired too, but when I originally put this colour on, I was bleach blonde and that’s growing out still. And the new hair thats growing, the roots, are dark grey, so they take the colour as well. And I’ve been with this hair colour for about 2 years as well, so I think the colour is REALLY deep in my hair follicles and whatnot. So I think it’s a combination of these three facts really. I know my friend has the same hair colour and though she’s medium blonde, for some reason the colour doesn’t seem as vibrant on her as it is on me. So, yeah my guess is that you’ll have to lighten your hair. Try a low percentage peroxide first, leave that for 4 weeks before you dye your hair this colour, because your hair will need some rest after bleaching (I recommend soaking your hair in any vegetable oil overnight after bleaching!) if that’s not bright enough, repeat, etc.. I have been dying my hair Paprika for about a year and a half now. I love the colour but I’m keen to try and go platinum. I’m naturally a very dark blonde / light brown. Can anyone give any tips on where I should start? I’ve used Colour B4 in the past to remove the colour and then dye but not sure what the intense orange will do? Hi I just wanna say I love your hair! I wanna do my hair like this so bad but at the moment my hair is blue Nd don’t want to have to bleach my hair again;c bleaching it for the blue was bad enough is there anything that could help gets majority of the blue without bleach ? Hey, did you wet your hair before you applied this? I’m transitioning from Mango Intense Copper too, and I’m not sure whether to wet my hair or not. Thanks! I really want to dye my hair with the Paprika Power dye, but I’m not sure if I need to bleach my hair first. My hair is a dark blonde. Do you believe it would still be vibrant and gorgeous? I have dyed my dark blond hair with Paprika Power and it just hasn’t done anything in my hair. The most damaged parts of my hair (ends)got the colour but the other parts don’t. MY hair is now just a terrible mix of dark blond and copper. Any suggestion? Thanks. I’ve used the Intense Mango Copper before and i loved the colour but wanted to go a little brighter. You’ve inspired me to get down to Boots tomorrow and give this a try! Thanks so much! Full of salient points. Don’t stop benliveig or writing! While I agree with most all of what you have to say in this posting … if Perot had not dropped out over his daughters wedding threats and then trying to get back in the race, he may have had a very good chance of winning.Only time will tell in 2012. Most of America would like to try something different.